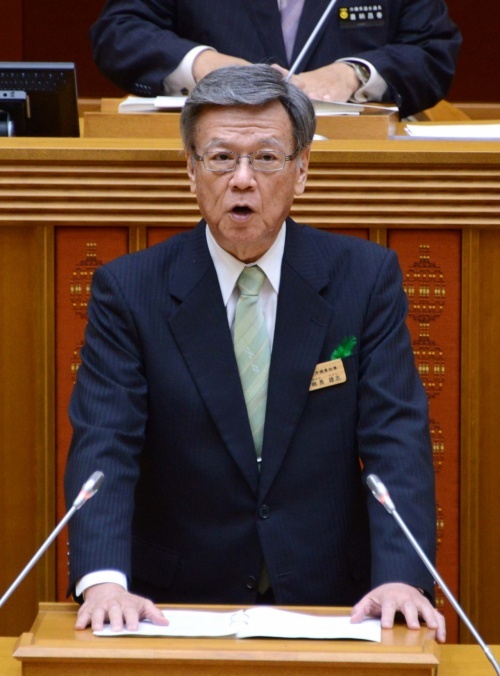 Governor Onaga presenting his administration’s 2016 objectives to the Prefectural Assembly on the morning of February 16. At a regular meeting of the Prefectural Assembly on February 16, Governor Takeshi Onaga presented his administration’s 2016 objectives. He also spoke about the Henoko landfill permit authorized by the previous administration, saying that he withdrew the landfill permit because it was identified as having legal flaws that warranted its nullification. Going forth, he says he intends to continue to attest to the validity of Okinawa’s stance in court and elsewhere. Onaga claims that 2016 will be an important year for accelerating Okinawa’s development, following the accomplishments of the last 5 fiscal years under the 10-year Okinawa 21st Century Vision Master Plan. His administration will conduct an interim assessment and make changes as needed to build on past success and promote Okinawa’s development. With the goal of promoting Okinawa’s economic growth, Onaga declared the formulation of a propulsion plan aimed at implementing the Asia Economic Strategy Plan from 2015. Centered on an Asia Economic Strategy Division to be established this year, Onaga wants expansion and strengthening of leading industries related to tourism and telecommunications, linked to the fast-growing dynamism of Asia. He also supports molding Okinawa into an international logistics hub. Onaga explained that the challenges of the coming fiscal year span over many fields, and outlined his objectives for the coming year. These include concrete policies for promoting tourism, combatting childhood poverty, making developments on the outlying islands of Okinawa, bettering education, and improving employment and the labor problem.